Hostelworld's winner 4 years in a row of most popular Hostel. 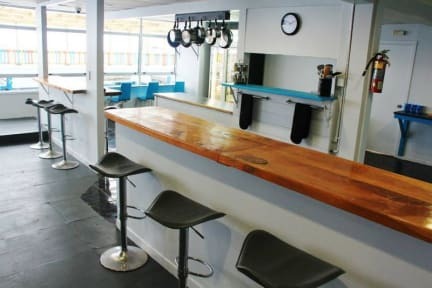 The Attic Backpackers is a clean and modern backpackers haven, located in the heart of Auckland City. Just one street over from the iconic skytower and a minute walk from the hustle and bustle of Queen street, our location could not be better! As the sister hostel of popular Ponsonby Backpackers, we pride ourselves on providing exceptional service and travel advice to our guests as well as maintaining a spotlessly clean and welcoming environment! Our top floor hostel features a wonderful, large outdoor covered deck with chill out spots, dining area, and an attached, well-equipped communal kitchen. We offer large and small dorms as well as female only dorms, private single and twin rooms. All linen is provided free. **New to The Attic Backpackers** We now operate a Travel and Tour desk so that you can plan your NZ adventure right here with us! We can book everything from bungy jumps to skywalks, buses to car and camper van hire, day trips to waitomo and hobbiton and much much more! Make sure you check it out during your stay, NO BOOKING FEES or hidden charges, just another way we can help you out! Please let us know your arrival time upon booking. If arriving late at night or early morning, please contact us for instructions.